The shoulder is composed of the acromioclavicular and the glenohumeral joints. The acromioclavicular joint is formed by a junction between the collarbone (clavicle) and the tip of the shoulder bone (acromion). The glenohumeral joint is formed by an articulation of the upper arm bone (humerus) with the shoulder blade (scapula). The three major types of shoulder arthritis are osteoarthritis, rheumatoid arthritis, and post-traumatic arthritis. Osteoarthritis affects the cushioning cartilage on the ends of shoulder bones that enables them to move smoothly. Osteoarthritis occurs when the cartilage is damaged as a result of previous injury to the shoulder, or normal wear and tear process as we age. As the cartilage is destroyed, the bones begin to rub against each other and cause pain, stiffness and weakness. Rheumatoid arthritis causes joint lining (synovium) swelling and joint space narrowing. It progressively destroys the bones and soft tissues of both shoulders and other joints of the body. Post-traumatic arthritis is a form of osteoarthritis that develops after an injury, such as a shoulder fracture, dislocation, or a rotator cuff tear. Patients with shoulder osteoarthritis usually complain of progressively worsening pain, which is aggravated by normal daily activities. In the glenohumeral joint OA, the pain is often felt in the back of the shoulder while in the acromioclavicula joint osteoarthritis, the pain is centered on the front of the shoulder. Pain in both shoulders and other joints in the body is a sign of rheumatoid arthritis. In the early stages of rheumatoid arthritis, only one shoulder joint may be affected. Swelling of the shoulder is more common with rheumatoid arthritis . In both, rheumatoid arthritis and osteoarthritis, patients often experience decreased shoulder range of motion, which makes it difficult, for example, to comb hair or reach for items on high shelves. Pain is commonly accompanied by clicking or snapping sound with shoulder movement. Night pain is common in the advanced stages of shoulder arthritis. A detailed history including medical conditions, activities that aggravate shoulder use, and any prior injuries is important. During a physical examination, your doctor will look for tenderness and swelling, limited range of motion as well as identify positions which cause pain to your shoulder joints. X-ray will be taken to evaluate the extent of joint damage and to check for any evidence of fractures. 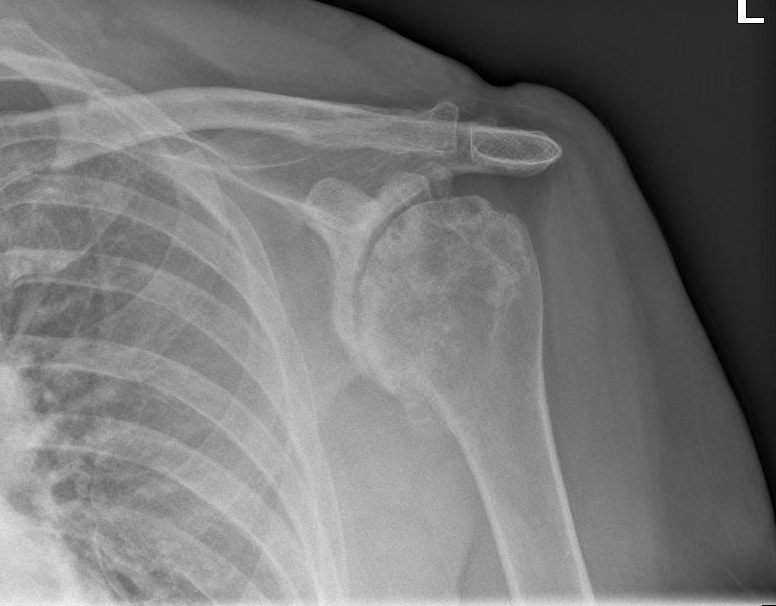 By the time shoulder arthritis can be seen on x-rays, there has been significant damage to the shoulder joints’ surfaces. Treatment options depend on the severity of shoulder arthritis symptoms and the patient’s overall medical health. Non-surgical treatment options include pain control, physical therapy, heat and cold therapy, and corticosteroid injections. Pain control: For the early stages of shoulder osteoarthritis, over-the-counter pain medications help to reduce or alleviate pain. Anecdotal reports have been favorable in patients on glucosamine/chondroitin supplements. However, these supplements may be contraindicated with other medications and may cause excessive bleeding during surgery. Always consult your doctor before taking dietary supplements. Physical Therapy: Physical therapy and activity modifications serve to strengthen the musculature around the shoulder and reduce stress on the joint cartilage. Avoiding aggravating activities and having periods of rest after these activities may be helpful. Applying heat or cold, and gentle exercises may be recommended. Steroid Injections: Steroid injections typically provide significant temporary pain relief. They can be used until symptoms progress enough to require surgical treatment. Arthroscopy: If the cartilage damage or wear is limited, minimally invasive, outpatient surgical arthroscopy may be an option for patients with early stages of shoulder arthritis. Using pencil-sized instruments with two or three small incisions, surgeon can remove any loose bodies or inflammatory joint tissue, and smooth out irregular cartilage surface, which can markedly improve symptoms. The acromioclavicular joint arthritis is most commonly treated by removing a small piece of bone from the end of the collarbone. Arthroplasty: If the joint surface is completely worn out then joint replacement is the only solution. Typically, the improvement in pain and shoulder function after the shoulder joint replacement is dramatic. The glenohumeral joint arthritis can be treated by replacing the entire shoulder (total shoulder arthroplasty) or by replacing the head of the upper arm bone (hemiarthroplasty).